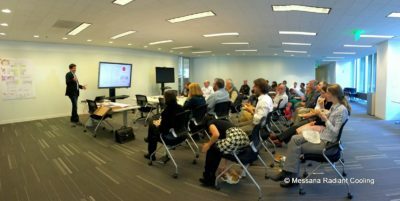 Messana Radiant Cooling Kicks Off a Lunch and Learn Tour With Global Design, Architecture and Engineering Firm HOK. Immediately on the heels of hiring new Messana Radiant Cooling West Coast Sales Manager, Dan McDunn, and capitalizing on enormous traction and interest in the AEC market for radiant cooling, a tour of 10 top end global design firms continued Tuesday with a visit and presentation to HOK’s San Francisco office. Radiant cooling and heating is quickly becoming the preferred method for space conditioning in high-end projects of all types. From custom residential to multifamily, to office, retail, civic, academic and healthcare, architects and engineers that design these spaces value the Messana Radiant Cooling system for a number of reasons. (1) First, and foremost, is the thermal comfort of building occupants. Utilizing radiant for both heating and cooling insures that maximum occupant comfort is achieved at all times irrespective of fenestration, ceiling heights or other elements affecting design loads. (2) Second is the complete freedom of design that radiant affords. With no ductwork to contemplate, architects are free to design unimpeded by soffits, chaises, registers and returns, and over the life of the building interior designers don’t have these elements to contemplate as spaces evolve and furnishings change. (3) Third is indoor air quality. With no blowing dust, and no noise, a radiant heating and cooling system delivers more human benefits than just thermal comfort and good design. It also delivers an optimum experience for those that suffer the consequences of poor indoor air quality that often accompanies forced air systems. Unlike antiquated radiant floor heating systems, a radiant ceiling delivers much faster response times, completely eliminates the risk to finished floor surfaces, and can remove the need for ductwork, soffits, chaises, registers and returns – elements that impede good design. Messana provides all the benefits of a radiant system year round, not just during heating season. While not new in Europe (a 20 year track record and over 10,000 installations), Messana is fairly new to the United States. 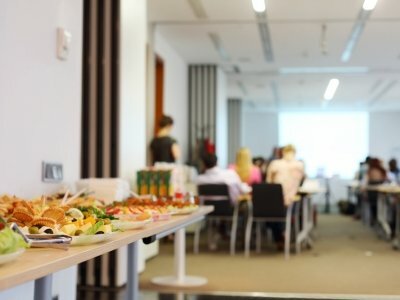 In this presentation, attendees learned about designing with radiant, the science behind the comfort and health benefits of the Messana system, and a few case studies were detailed to give an understanding of how to work with Messana Radiant Cooling, and why clients prefer this over conventional heating and cooling. If you would like to learn more about the Messana Radiant Cooling system please call Dan McDunn at (510) 710-1907 to set up a site visit or a lunch and learn at your firm.